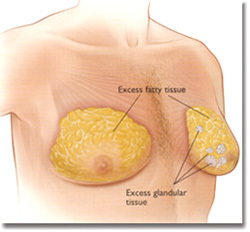 Gynaecomastia is an excessive enlargement of the male breast. It may affect one or both breasts. For some teenage boys and adult men, it can be a normal occurrence at a certain stage of life. Although men and boys who have gynaecomastia find it embarrassing, it is a common condition. After an examination, your surgeon may require further tests such as a mammogram or ultrasound to determine the make-up of breast tissue and to plan the best surgical approach. These investigations will also check for the presence of breast cancer, which is highly unlikely. The complete 'Treatment of Gynaecomastia' pamphlet is available from Dr Beagley.